Back around 1982, when my son Jacob was small.......I bought 3 patterns from U-Bild Enterprises in Van Nuys, California. Back in 1982, I made the yellow bulldozer and the green farm tractor. I did not make the fire engine. I did keep all 3 patterns in my file cabinet. 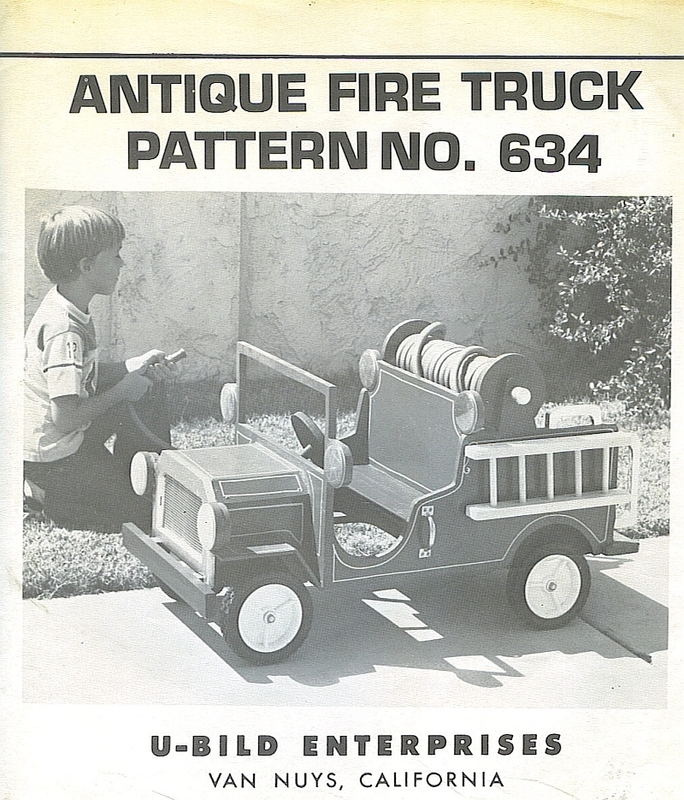 The fire engine pattern is titled Antique Fire Truck Pattern No. 634. I remember that back in 1982 I found errors in the bulldozer plan. 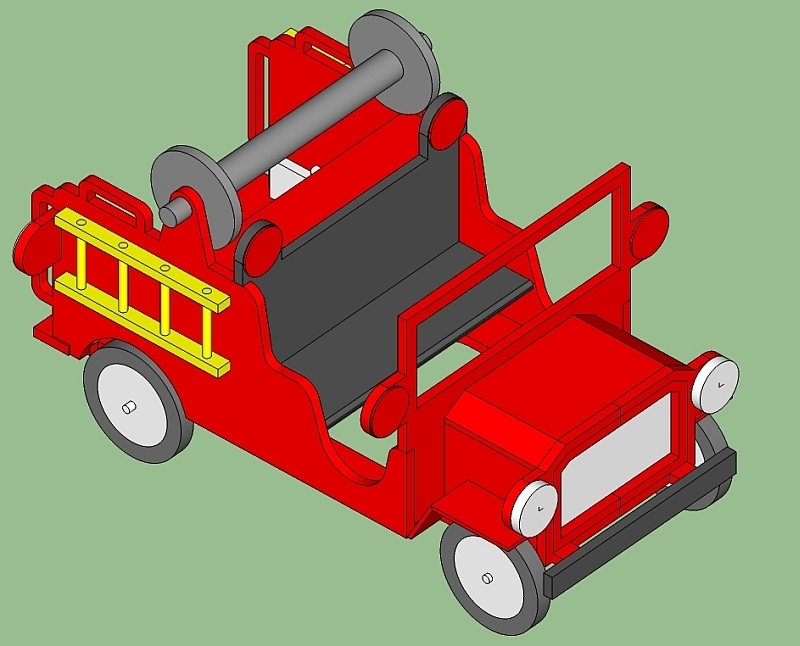 I decided to enter this fire engine pattern into Google Sketchup so I could find any errors in the pattern. I did find some significant errors in the pattern by using Google Sketchup. My local Menards had 5/8" plywood for $25 per sheet. This plywood needs to be the type that is "good on 1 side" or sanded on 1 side. I ended up paying $35 per sheet from my local lumberyard. Wow, plywood is expensive!! I set the 4x8 sheet on sawhorses and started cutting out the pieces. For this piece, I printed out the pattern using Google Sketchup. I tried to use the table saw as much as possible when cutting out the pieces to get straighter lines and better fitting joints. It is impossible to cut perfectly straight lines with a jig saw. My old 11 TPI jig saw blade did not cut very fast. I bought a new 6 TPI blade and it cut much faster. I had to put a 1/8" thick spacer in the first cut so it would not distort as I cut the 2nd edge on the table saw. The 1st major assembly step was to attach the 2 sides and windshield to the bottom base piece. To avoid not hitting the 5/8" wide plywood when using finishing nails, I used an old trick. I cut off the head of a finishing nail with my pliers. Then I used this finishing nail as my drill bit. I pilot drilled each hole. This is particularly helpful when nailing from the outside and you can not see the inner piece. I drew 2 boundary lines first on the inside, then drilled from the inside. That made it easy to nail from the outside and never miss the target. I chose to assemble the rear of the fire engine first. I did drill the 45 degree angle hole for the steering column before I attached the seat back. Once the seat back is assembled, there is not enough room to fit the drill and bit at 45 degrees. 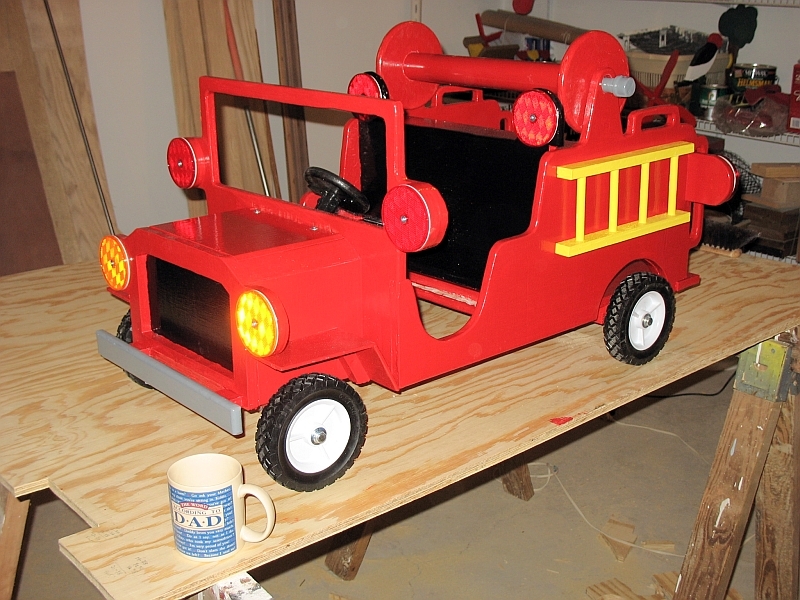 The next step was to build the front end of the fire engine. It took me a long time to get the angles right on the engine compartment. I marked a line on the frame where the 3/4" steering column would theoretically hit if it extended that far. This let me get the 45 degree angle right on the first piece. Then I could finish drilling through the 2nd piece and make sure it was still 45 degrees. I used my black plastic 90 degree angle to make sure the grille was vertical when glued up. I held the blocks with a vise in the drill press and drilled the 1/2 holes using a Forstner bit. I filled all the nail holes and any knots with white dry wall filler. I then sanding the entire fire engine. 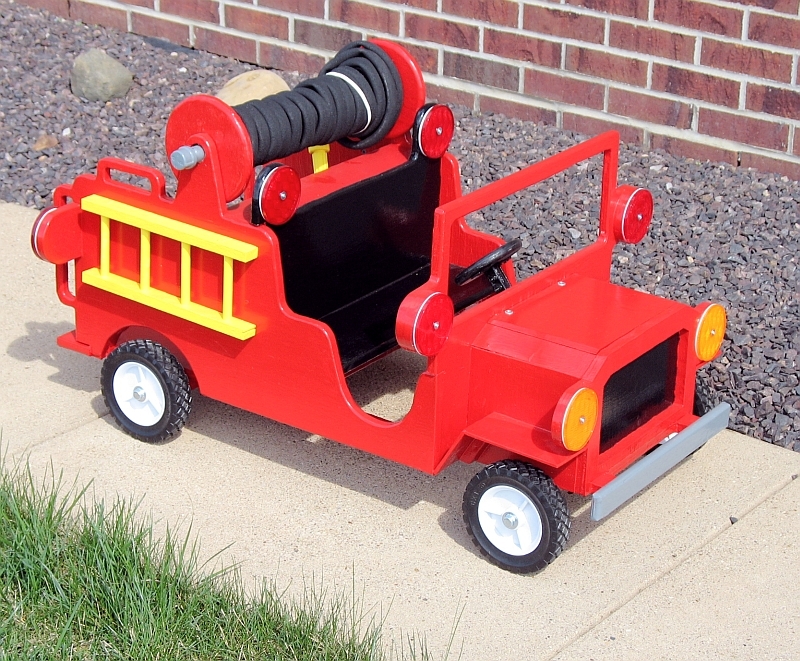 I chose a red enamel, oil-based paint for the fire engine red color. I had used red latex on smaller fire trucks and was not pleased with the finish. The latex was not shiny enough for my tastes. I used one coat of the white primer. After putting on 1 coat of red enamel, it was obvious that 2 coats of red would be required. I did have to soak the piece of heater hose in hot water to make it more pliable. I also changed the design a little in that I made a 5/8" thick spacer with a 3/4" hole to go in the engine compartment. This guides the steering rod assembly and negates the need for a washer on the bottom of the fire engine. The plans called for drilling the nuts and bolts, then inserting a locking wire through the hole. I chose to buy nuts with locking nylon nuts from Ace Hardware. Here is the completed rear axle assembly. I painted the 1/2" steel shaft red to keep it from rusting. I also painted this 1/2" shaft red to prevent rust. This project took 4 weeks to complete...working a little during week-nights and weekends. I cut the first piece on 2/12/2012 and completed them on 3/11/2012. Making the angled engine compartment was the most time consuming part of the project. It also took some time to figure out and build the steering mechanism. I am not happy with the design of the steering, in that when you turn the steering wheel all the way in one direction, you get very little effective turning of the fire engine. I may redesign the original steering mechanism to give the driver more turning faster.